A granite tile countertop is an excellent option for those who desire the look, lasting value and superior durability of granite, but at a cost savings of up to 50% - 75% compared to a full-slab granite countertop installation. Granite is an igneous rock formed over millions of years from hot liquid magma and composed of various minerals such as quartz, feldspar and mica. The particular mix of minerals create the unique colors, textures and pattern movement found in all the different varieties of granite... over 2700 varieties and counting. Granite is nearly as hard as diamonds, which is why granite is considered the most durable, heat and stain resistant countertop surface available. 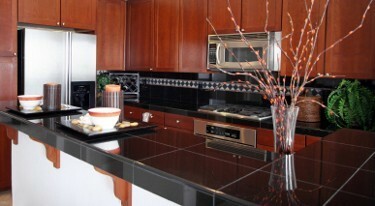 Engineered quartz countertops are a close second, but hot pans can damage the resin used to make quartz countertops. Granite is also the most hygienic (tied with quartz) surface and highly resistant to bacteria. Now of course, you get essentially the same qualities whether installing granite tile or a full-slab, so lets look at the differences. Generally a granite tile countertop will cost 50% to 75% less than a full-slab. For a full-slab you’ll typically pay between $40 and $125 per square foot (Beware of the very low end quotes). Most commonly, though, you'll pay $55 - $65 sq. ft. Installing granite tile will only cost about $10 to $30 per square foot. And sometimes, in some areas, and with very cheap granite tile the cost can go as low as $7 sq. ft. saving you a bunch. This above is also true when installing outdoor kitchen countertop tile. But a tile countertop is significantly different than a full slab granite countertop. The big difference here is in the volume of stone and the cost of fabrication. Granite tiles are much thinner than a slab, so less stone is consumed for the same surface area. Also, the skill and tools required to work with a slab of granite are more sophisticated and specialized than those required installing tile. In fact, a competent do-it-yourselfer with tile experience can install a granite tile countertop. Of course, it is necessary to use grout between the tiles when installing a granite tile countertop. The only place you’ll encounter grout with a full-slab is at the back edge where the countertop meets the backsplash. In general, it is recommended to apply a sealer to granite to retard staining. However, there are several granite varieties that are so dense and stain-proof that they don’t need sealing, in fact, will not absorb a sealant. But even for those varieties that do need sealing, it’s not a complicated job and it doesn’t need to be done more than every 3-5 years and often much longer. Grout presents unique challenges mainly regarding care and maintenance. Grout easily attracts dirt and grime, is porous, can crack and break down when absorbing excess moisture. The grout must be sealed, cleaned and maintained more particularly than the granite tiles. The good news is that grout lines are very narrow with granite tile and you can use the same impregnating sealer to seal the tiles and the grout. Typically, once the grout is well sealed, it’s not much of a problem. It will still require more attention than the tiles or a slab countertop, but with normal cleaning, care and maintenance it will look great for a long time without much extra hassle. With a full-slab countertop you can create almost any backsplash design that works with the colors of your granite. However, with a granite tile countertop you have grout lines as an added design element. This may limit what you do for a backsplash, especially if you are considering using a different tile and particularly a different size of tile.... the grout lines start to clash. Most often you'll use a 12x12 inch granite tile for a countertop. The dimensions work best. Now, using that same tile as a backsplash will look fabulous and is probably the best option for over-all design continuity and visual impact. And you can still spice it up with some smaller detail pieces (1x1 or 2x2 tiles of different color/texture/material) in the center of the backsplash where grout lines cross at the larger granite tile corners. Granite also wins out when compared to other tiles. Porcelain is becoming popular and is more sturdy than ceramic with lots of color choices, but does not provide the same look or durability as granite. Marble or travertine is sometimes considered, but these stones are not a good choice for the kitchen as they will etch or corrode upon contact with acidic foods. Fine for a bathroom countertop though. So, if you love the look and functional advantage of granite, don’t mind the extra grout maintenance and want to save some big bucks then..... a granite tile countertop is a perfect choice for your project.